The Dutch oven is a versatile piece of traditional cookware that’s so well-loved by home-cooks and professionals, it’s still ‘must have’ kitchen equipment. All of these ‘ovens’ qualify as the best Dutch ovens for their ability to sear, steam, braise, caramelize, roast and bake bread. Or cook delicious meat and vegetable casseroles. Each of our top-rated Dutch ovens has small design differences that make them easier to use. And suitable for different recipes. We also found that U.S. made Dutch Ovens are just as good, but a lot cheaper than, ones imported from France. 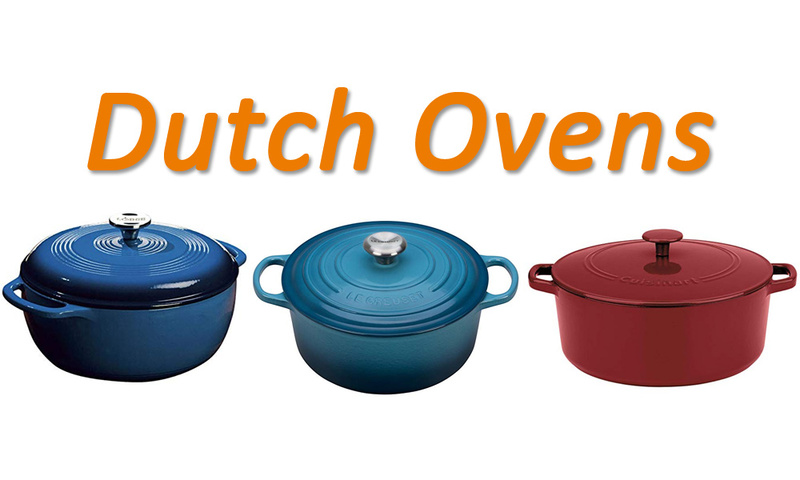 So read on and find your best Dutch oven and always serve delicious meals! 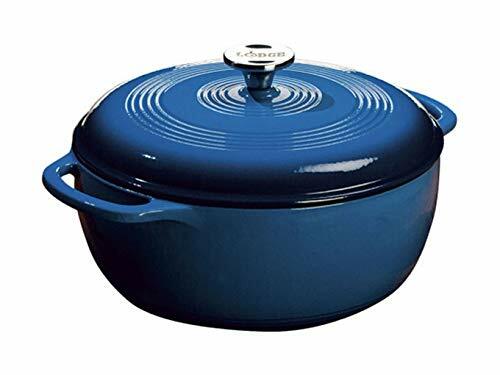 There’s no need to spend more than you need on a Dutch oven, as the 6-quart Lodge Color-Enamel Dutch Oven is just as efficient as French versions costing much more! And we don’t say that lightly, as we’ve logged more than 60 hours of kitchen testing on this dependable, sensibly-priced cookware. The Lodge Enamel Dutch Oven is easier to handle, which is important when you’re removing a full 6 quart container from a hot oven. And this is because it has larger handles than the average Dutch oven. It’s easier to get even cooking and faster washing because of its lightly curved design. This shaping stops food becoming trapped in the pot’s corners. And this Dutch oven is wider, with shorter sides than some models. So you can get better high-heat searing and wonderful umami flavors from your meat. As for gravy-making, when you braise food in the wide-sided, Lodge oven, the water evaporates quickly leaving delicious, ‘reduced’ sauce! This is slightly larger than the Lodge Dutch oven and we found that it cooked evenly. It allows water to evaporate efficiently, leaving you with gorgeous flavors, too. This is important to the finished dish, as it intensifies the flavor of any meat or vegetable dish cooked inside. As a larger piece of cookware, it’s heavy to handle. So we’d rather see larger handles on pots of this size. It’s bigger than you need for the usual home-cooking recipes and more expensive than the Lodge. 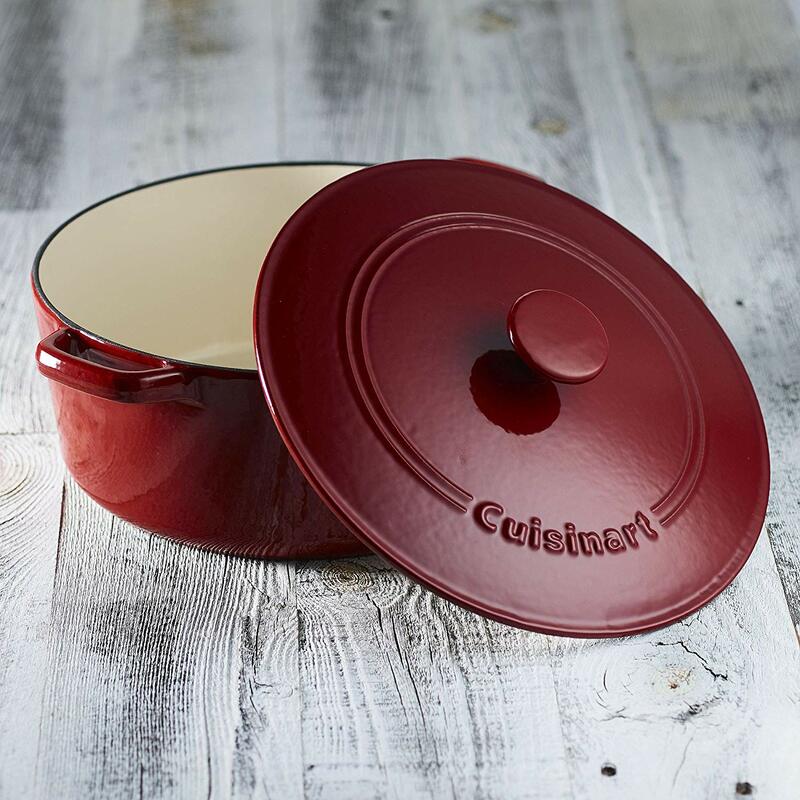 However, we recommend the Cuisinart 7-quart cast iron enamel casserole for pros and large capacity home-cooking. This is the smallest out of our 3 best Dutch ovens and the most expensive. Le Creuset cast iron cookware has a global reputation as the best you can buy. It has the thickest and most durable enameling of any Dutch ovens on offer. Actually, as a piece of traditional kitchen cookware it’s almost an objet d’art, to be passed down the generations! And with a capacity of 5 1/2 quarts, it’s also the perfect size for most home recipes. In addition, as far as safe handling is concerned, it has the largest handles. This means you can safely handle this casserole dish whilst wearing oven gloves or thick, pot pads. The enameling doesn’t chip and make your cookware look unappealing. So it will last several life-times. This is something dedicated home-cooks dream of owning, but it isn’t much better at cooking than the Lodge or the Cuisinart. For most cooks, the Lodge 6 quart is an excellent choice for it’s first-rate cooking efficiency and it’s sensible price. If you need to cook larger quantities, go for the equally high-rated Cuisinart Dutch oven. 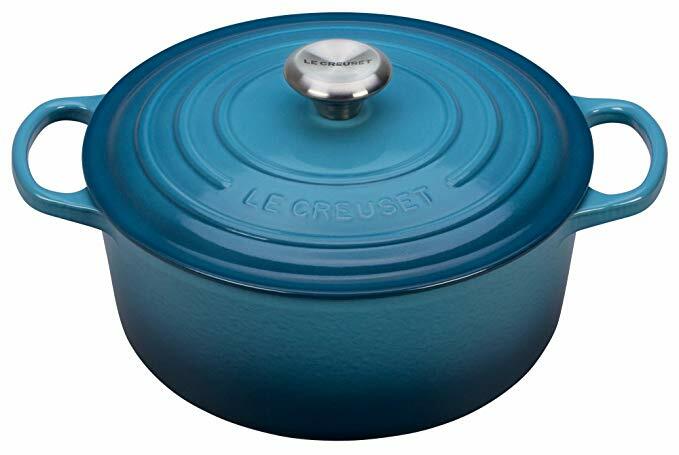 And if you want something with almost iconic status in the world of cooking, invest in a Le Creuset ‘French’ Dutch oven! Bon appetit!